Part I of these tables gives daily predictions of the times and heights of high and low waters at a selected number of Standard Ports. The list of Standard Ports is given at the front of the book. 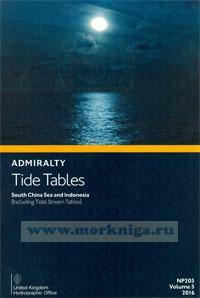 Part l of these tables gives daily predictions of tidal streams at a limited number of places. Part II gives data for prediction at a large number of Secondary Ports; this is in the form of time and height differences, referred to one of the Standard Ports in Part I. Part III lists the harmonic constants which can be used for prediction by the Simplified Harmonic Method of Tidal Prediction, (see also page xxiii). Part Ilia lists harmonic constants of the tidal streams which can be used for prediction by the Simplified Harmonic Method of Tidal Prediction, (see also page xxiii). This volume also contains an introduction dealing with, in particular, the effect of meteorological conditions on tidal heights; there are also a number of special tables and other information for use with the tide tables. The symbols for the New and Full Moon , First and Last Quarter are shown in the Standard Port daily predictions on the days on which they occur. The symbols for First and Last Quarter are shown as for Standard Ports in the southern hemisphere.